1 28 de agosto de 2013 OBJETIVOS Content Objective: S.W.B.A.T. 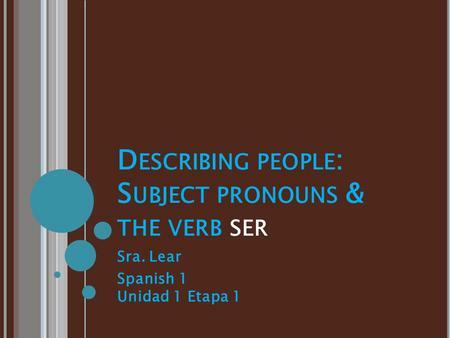 describe people using subject pronouns and the verb ser. 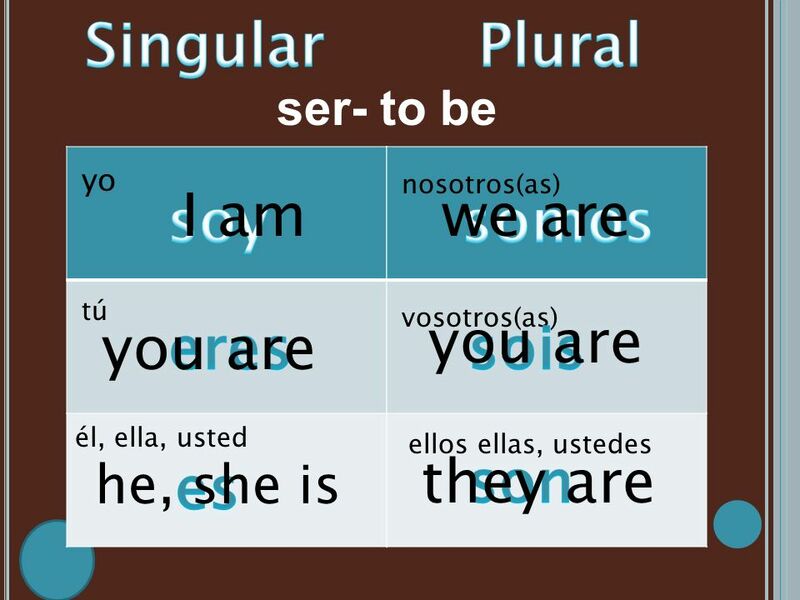 Language Objective: Students will learn the basics of conjugating verbs by matching the verb ser with subject pronouns. To discuss people in Spanish, you will often use subject pronouns. 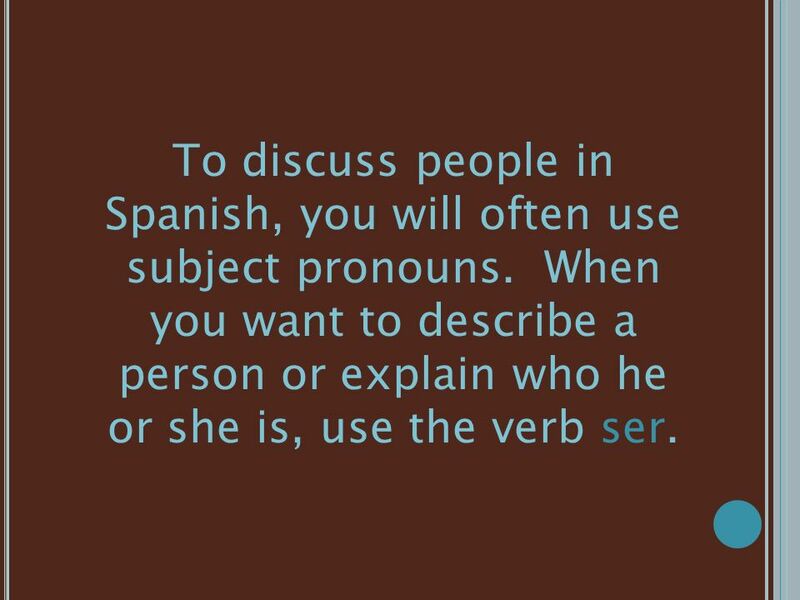 When you want to describe a person or explain who he or she is, use the verb ser. 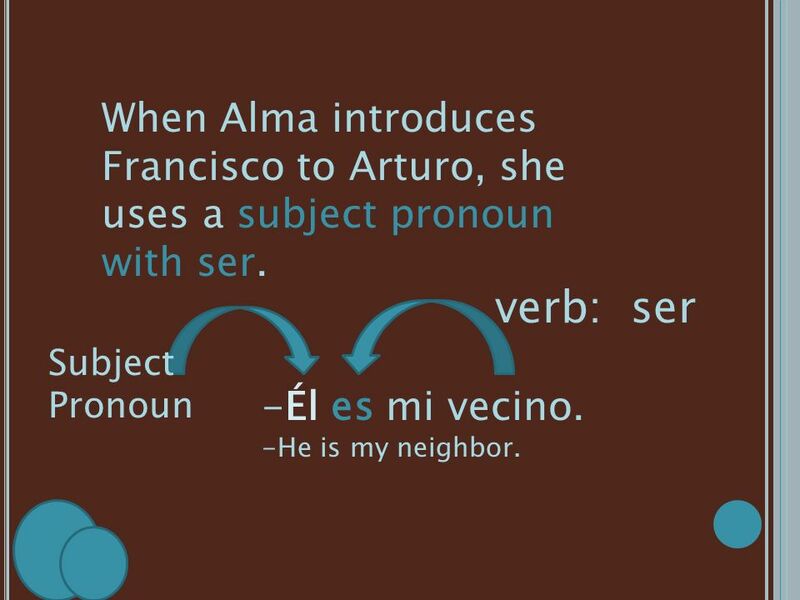 5 When Alma introduces Francisco to Arturo, she uses a subject pronoun with ser. 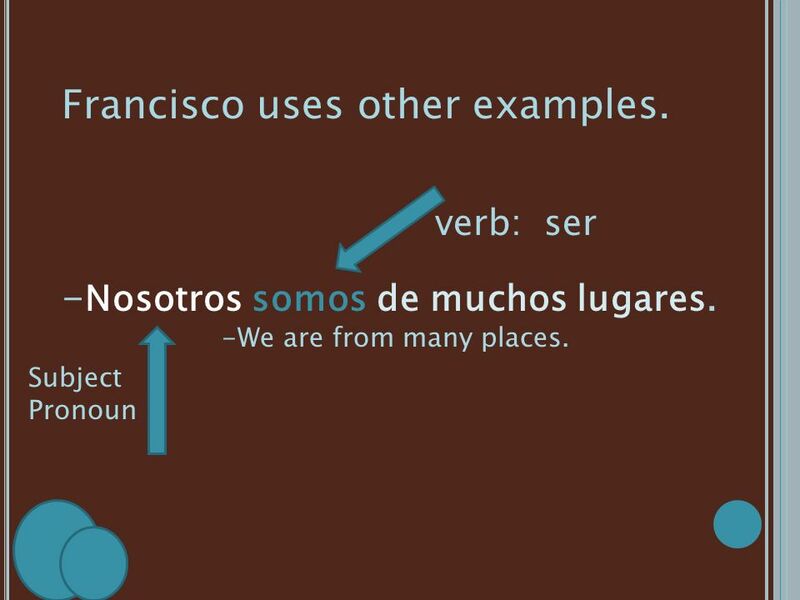 6 Francisco uses other examples. 7 un or una does not appear before a profession. 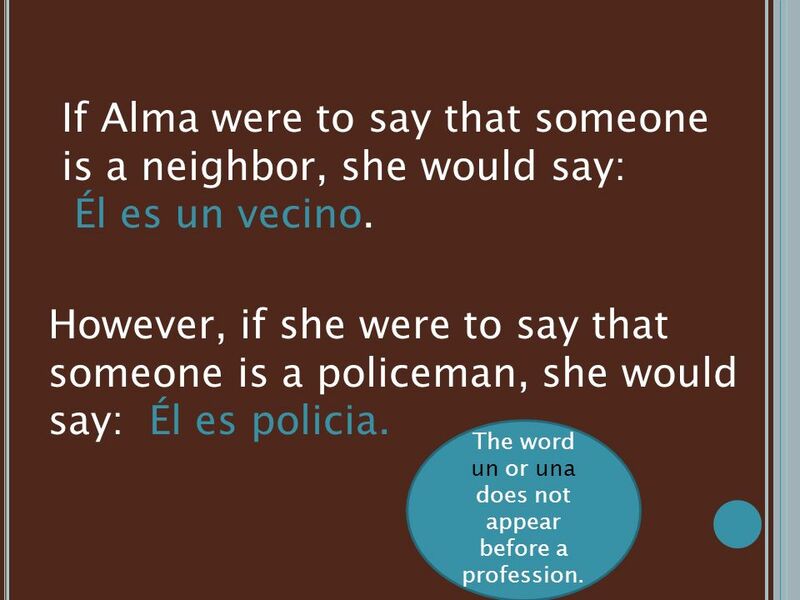 If Alma were to say that someone is a neighbor, she would say: Él es un vecino. However, if she were to say that someone is a policeman, she would say: Él es policia. The word un or una does not appear before a profession. 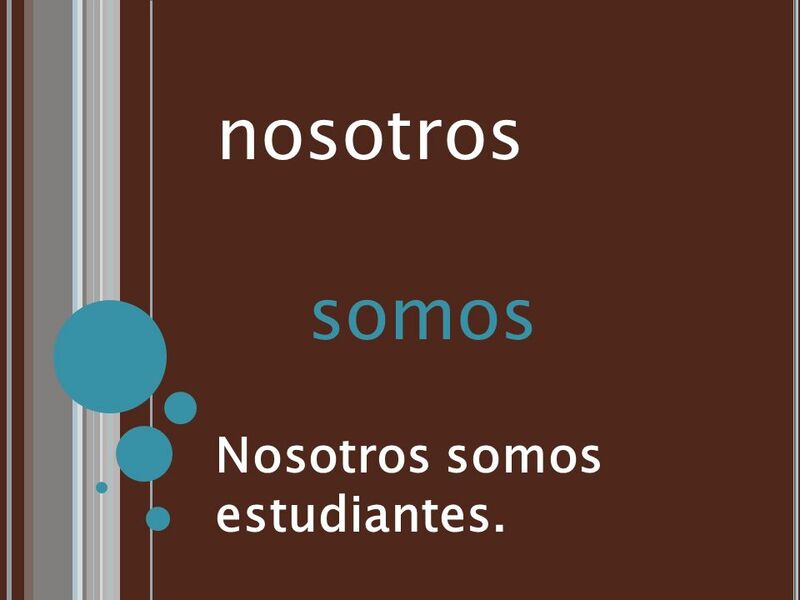 8 nosotros somos Nosotros somos estudiantes. 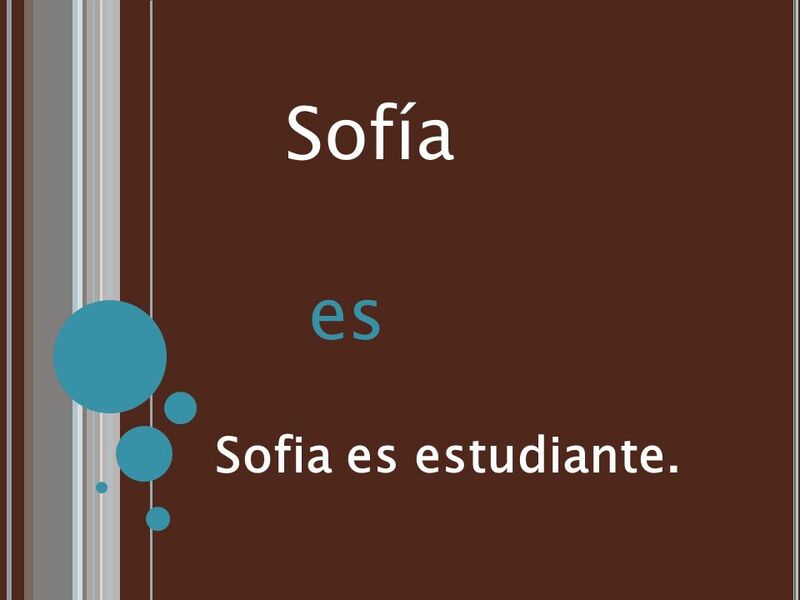 9 Sofía es Sofia es estudiante. 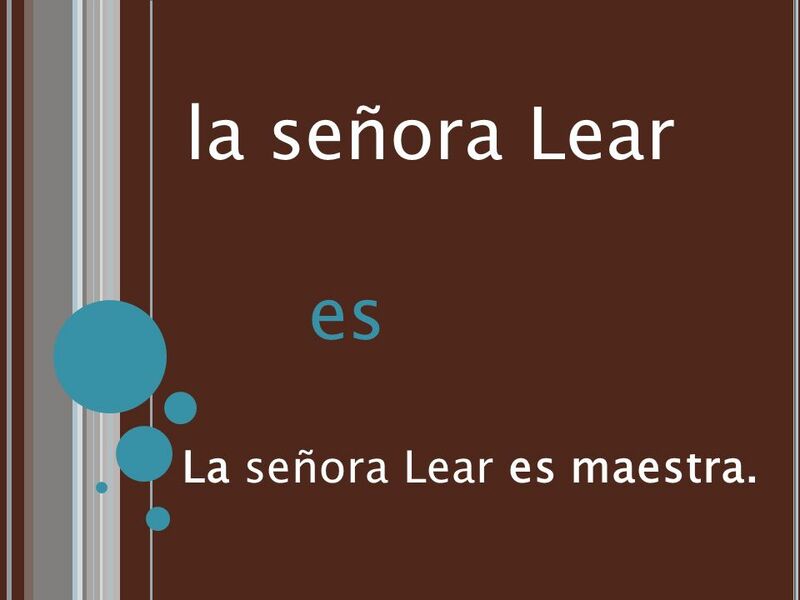 10 la señora Lear es La señora Lear es maestra. 11 Rebecca y yo somos Nosotras somos amigas. 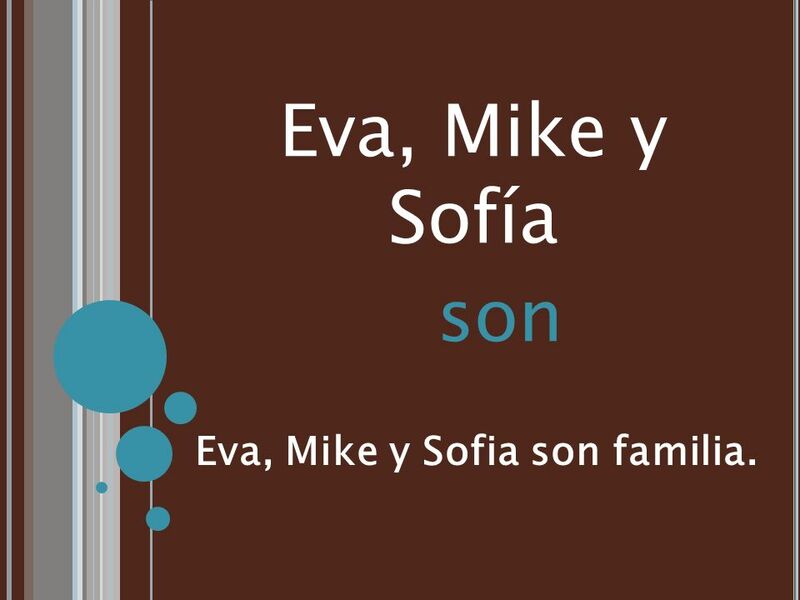 12 Eva, Mike y Sofia son familia. Eva, Mike y Sofía son Eva, Mike y Sofia son familia. 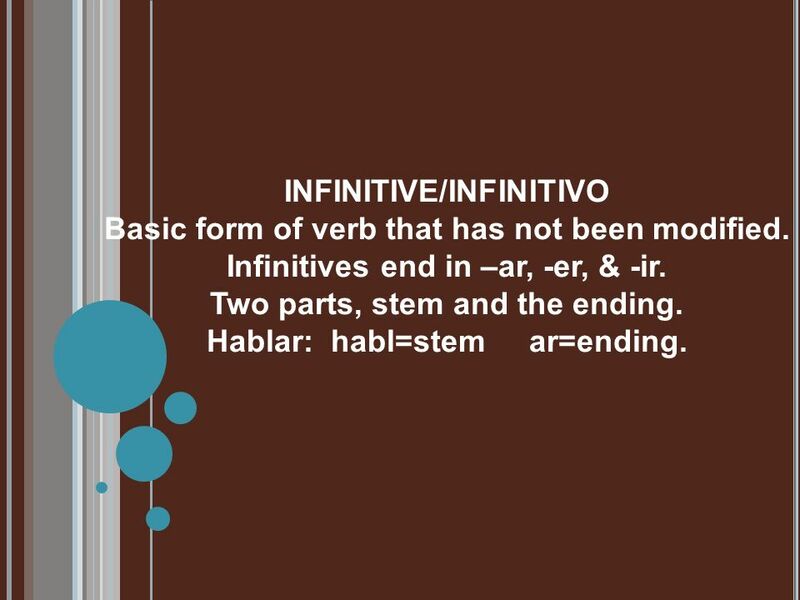 13 INFINITIVE/INFINITIVO Basic form of verb that has not been modified. Infinitives end in –ar, -er, & -ir. Two parts, stem and the ending. Hablar: habl=stem ar=ending. 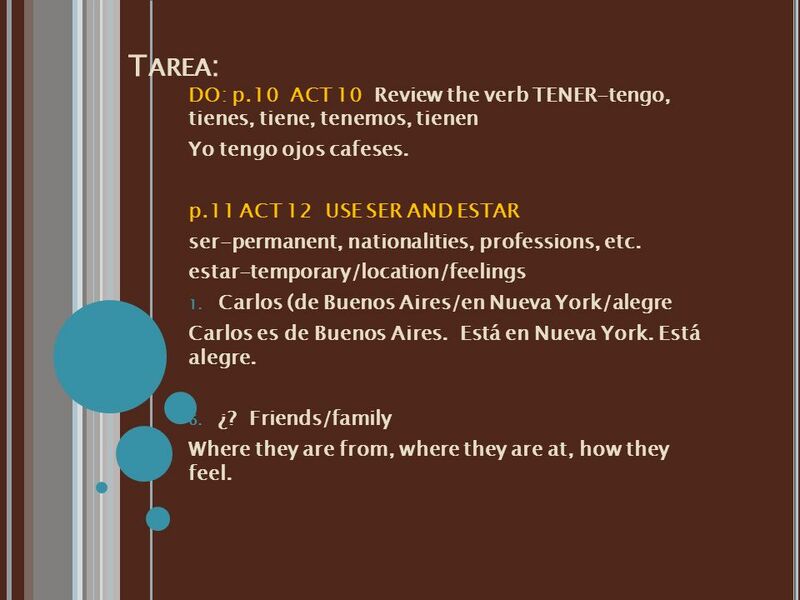 14 Tarea: DO: p.10 ACT 10 Review the verb TENER-tengo, tienes, tiene, tenemos, tienen Yo tengo ojos cafeses. p.11 ACT 12 USE SER AND ESTAR ser-permanent, nationalities, professions, etc. estar-temporary/location/feelings Carlos (de Buenos Aires/en Nueva York/alegre Carlos es de Buenos Aires. Está en Nueva York. Está alegre. ¿? Friends/family Where they are from, where they are at, how they feel. Descargar ppt "28 de agosto de 2013 OBJETIVOS Content Objective: S.W.B.A.T. 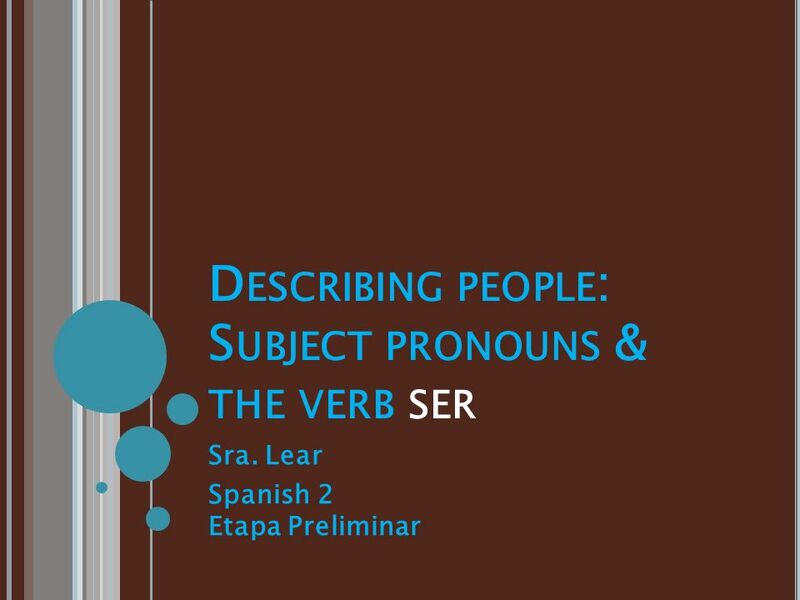 describe people using subject pronouns and the verb ser. Language Objective: Students." Present Tense.  El Verbo – The action word in a sentence  El Infinitivo – The infinitive (to + a verb)  To walk = caminar  To run = correr  To hear.